Target’s gender-neutral approach to children’s toys is seeping into other aspects of the retailer’s business. Over the weekend the big box store unveiled a new brand of kids’ home decor that comes without boy or girl designations. 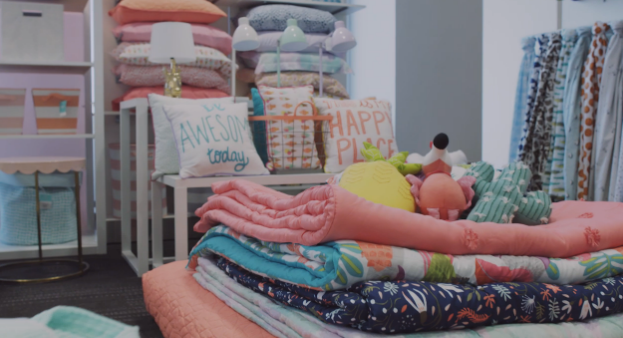 Target announced Sunday that the brand, called Pillowfort, will debut at stores later this month, marking yet another step in the retailer’s move toward a more gender-neutral store format. The line, which will replace the long-running Target house brand Circo, will still feature pinks and blues, but with more prints, patterns, and neutral motifs including trees, arrows, astronauts, and bicycles. Guggemos says that the company didn’t exactly set out to create a gender-neutral line. Instead, the approach was driven by consumers who previously criticized the company for using gender-based signs in the toy aisles. “It gets back to listening to mom, understanding what she’s looking for from Target and making sure we’re delivering the products and the content that’s going to be right,” Chief Executive Brian Cornell tells the Star Tribune. While developing the new Pillowfort line, the company asked children to create collages of their ideal bedrooms and questioned parents on what they would like to see. In the end, most chose neutral designs. The company isn’t doing away completely with boy- and girl-specific bedding and room decorations. It plans to still offer an assortment of princesses, superheroes, as well as licensed brands like Star Wars and My Little Pony in the department. Target plans to next tackle its children’s house brand of clothing. A new apparel line will debut this summer, replacing the Cherokee and Circo brands. A spokesperson tells the Star Tribune that while the company isn’t going to adopt a unisex or androgynous approach to apparel, some common themes will be found in both boys’ and girls’ clothing. Next Volkswagen May Buy Back, Replace Emissions-Cheating Diesels In U.S.
Next Up: Volkswagen May Buy Back, Replace Emissions-Cheating Diesels In U.S.